Solo-Bar.net – How to remove? 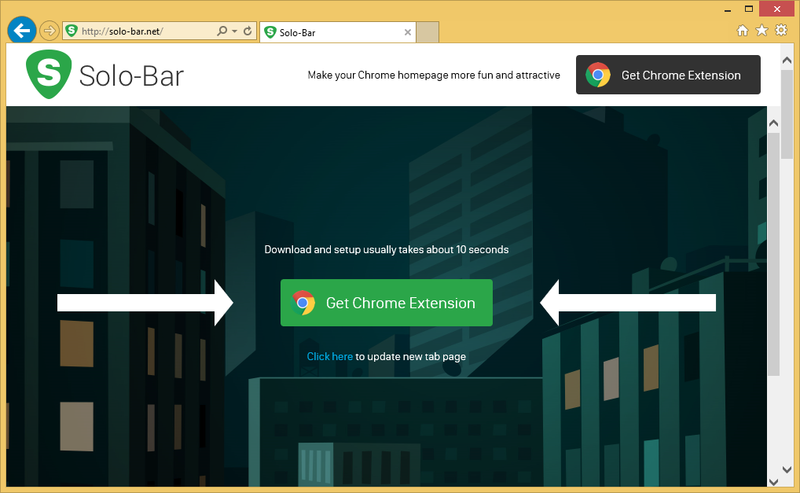 Solo-Bar.net is a questionable Google Chrome extension, categorized as a browser hijacker by malware specialists. You can download it yourself if you wish, but it can also enter via software bundles. So you not remembering installing Solo-Bar.net is highly possible. Solo-Bar.net is advertised as an add-on for those bored of simple homepages, and those who cannot stand unwanted ads being displayed on their browsers. Solo-Bar.net will allow you to change the color of your background. It will also make unwanted changes to your browser and generate questionable ads, which is rather contradictory to what it claims in the official website. These kinds of ads should not be considered to be reliable because they could lead you to questionable websites, where you could end up downloading a malicious computer virus. To protect your computer, we suggest you remove Solo-Bar.net. Why should you delete Solo-Bar.net? If you were to visit the official website, you would be able to downloads this browser add-on. But it’s also possible it has entered your computer without your knowledge. It can do that if it’s attached to free software. If it is attached and you do not notice, it will install along with the freeware. Default settings do not show attached items so if you opt for that installation mode, you are risking installing something you have not use of. What you need to do is select Advanced (Custom) settings. In them, you will be able to deselect all added items and you will not have to uninstall Solo-Bar.net or similar later on. Solo-Bar.net is advertised as a browser plug-in that can make your browsing experience better because it will allow you to change the background of your homepage, and will supposedly not display ads. It can also hijack your Google Chrome browser. If you did not install Solo-Bar.net willingly, you will be surprised that it has set a new homepage and new tabs, and you will not be allowed to change the settings back. You would have to first remove Solo-Bar.net and then manually change the settings back. The provided search engine also seems to generate altered Google results. They could be filled with sponsored content and you would struggle to find something relevant. It might also generate annoying ads that will be inserted everywhere you go. You could even get strange pop-ups asking you to download something. You need to avoid all suspicious websites and ads because you could be led to a dangerous website with malware just waiting for you. We strongly recommend you delete Solo-Bar.net. You can uninstall Solo-Bar.net in two ways, manually or automatically. If you choose automatic Solo-Bar.net removal, you will need to obtain a reliable removal tool. But you can also erase Solo-Bar.net manually. However, this takes more time because you will have to locate and eliminate Solo-Bar.net yourself.